Un-Scripted Theater Company creates smart, innovative, and entertaining improvised theater that delights audiences and advances the craft and art of improvisation. Just in time for Valentine's Day, Swipe Right returns after two sold-out runs last season! 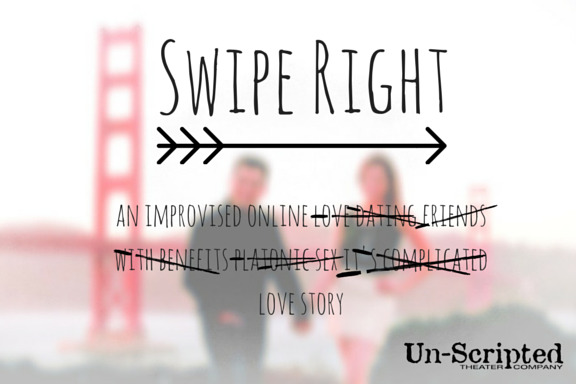 Join us for a fully improvised show about the craziness of online dating and the search for love in San Francisco. Vote to find out what happens to your favorite characters...hopefully leading to love, but definitely leading to laughs! Melissa is a member of the Un-Scripted Theater Company artistic staff and co-founder of their weekly late-night improv comedy show DASH. She has performed, directed, and taught improv for 15 years in San Francisco, Boston, and New York. She is a former longtime cast member at ImprovBoston, appearing in their Nickelodeon Award-winning Family Show among many others, and has also appeared on the Upright Citizens Brigade and BATS stages. Shara Tonn is an improviser, actor, clown and teacher based in San Francisco. She has been an ensemble member at Un-Scripted Theater Company since 2015. An alumna of the Stanford Improvisors and San Francisco Circus Center’s Clown Conservatory, Shara also performs with her duo Mona and Shara Do Improv as well as a variety of Bay Area comedy shows. When not bathed in stage lights, she works with the Medical Clown Project of San Francisco, acts and clowns in local gigs, does freelance science writing and teaches with a number of organizations including Stagebridge, Circus of Smiles, Aragon High School, and BATS Improv. Susie Sargent discovered and fell in love with improv over 20 years ago and enjoys sharing her passion through training, teaching and performing. She has taught the skills of improvisation to students aged 3 – 80. Susie is an ensemble and staff member of Un-Scripted Theater Company and loves surprising the audience and creating rich and diverse characters. Her ideal evening at home is a dinner party with improvisors who are likely to break into interpretative dance at any moment. Mona Thompson has been performing with Un-Scripted Theater Company since 2014 and officially joined the ensemble in 2015. She began improvising in high school in Washington DC, continued in college as a member of the Stanford Improvisors (SImps, for short), and never looked back. She currently lives in San Francisco and teaches improv to theater students and professionals all over the Bay Area. Learn more at monajthompson.com. Amber Dyson has worked in educational theatre for thirteen years. A Bay Area native, she is currently directing BACT's Advanced Performers production of Legally Blonde Jr., which will compete at Junior Theatre Festival West in February. A recent recipient of the Freddie G. Fellowship for excellence in musical theatre education, Amber doesn’t believe for one second that you can’t sing. Brad Gottesman is thrilled to perform in Super Scene at Un-Scripted Theater Company. Brad studied improv at UCLA and UCB Theatre and has performing for one ten years. Since moving to the Bay Area, Brad has performed in numerous shows through Endgames Improv, Un-Scripted Theater Company and Pure Moxie Players. Dana Cory improvised jazz professionally before discovering theater improv, and has been joyfully combining both for nearly twenty years. An alumna of BATS Improv and ImprovWorks, she has guested with many Los Angeles and San Francisco sketch and improv groups, played for years with SF fave Harold troupe SNAFU, and is a cast member of the Un-Scripted Theater Company’s late-night Saturday hit show DASH. Dana performs and produces music, comedy, and improv in a variety of media. Eric Kostenbauder has spent the past eight years improvising in his native city of Seattle. There he studied and performed regularly at Unexpected Productions before joining the ensemble at Jet City Improv and the renowned long-form group, Human Propaganda. Eric can currently be seen performing locally as a proud cast member of DASH here at the Un-Scripted Theater Company, as well as at Stage Werx Theatre with the Endgames team, UQAQUA. Jared Abbott is an Outer Sunset dweller. He improvised on and off in high school and at UC San Diego, but is extremely excited to have gotten back into the improv scene through the Un-Scripted Theater Company. Jared performs with the Un-Scripted DASH cast on Saturday nights and he enjoys messy meals and aimless adventures in his free time. Jared is a Special Education teacher in San Mateo and improv has really acted as the yin to his teaching yang. Joey has studied at BATS Improv and ACT, and has performed with Lombard Street Experiment (7-time winner of the BATS Cave Match), the San Francisco Improv Collective, and the Un-Scripted Theater Company. He believes the fundamentals of improv can help people open up and thrive off stage. Joey is the Deputy Chief of Staff of Change.org. He enjoys making up silly songs together with his wife Lucy and little boys Jackson and Parker. Un-Scripted Theater Company® is a registered U.S. Trademark. Unauthorized use is prohibited.